calls it an accident, the child’s family insists it was murder. Enter Leo Demidov, officer in the Ministry of State Security (MGB) - predecessor to the KGB. His job is not to solve the case but to keep the family quiet. One of the critical underpinnings of Soviet society is that crime does not exist, least of all crime not easily pawned off on the lingering influence of bourgeois self-indulgence. Ever the loyal State Security man, Leo intimidates the family into silence. Not long after, a rival within the MGB discredits him. He and his wife are forced into exile at an industrial backwater in the Ural mountains, where Leo has been assigned to the local militia at the lowest rung of the ladder. serial killer – one that is traveling by rail and murdering children all along the lines. And because there’s no such thing as a serial murderer in the Soviet Union – therefore no chance of help from official quarters – Leo resolves to catch the killer himself. from under him. The novel’s “twist” ending is an anti-climax and its epilogue a too-sweet flavor of heartwarming at odds with what has come before it. instructed to mark down the names of the children who answer incorrectly. These passages are glimmers of excellence on par with Martin Cruz Smith’s Gorky Park and Robert Harris’ Fatherland. 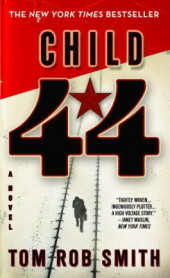 Therefore, in spite of its obvious flaws, Child 44 deserves credit for its unique setting. Worth a read by mystery lovers looking for a change of time and place, provided they can get past the often workman-like prose.